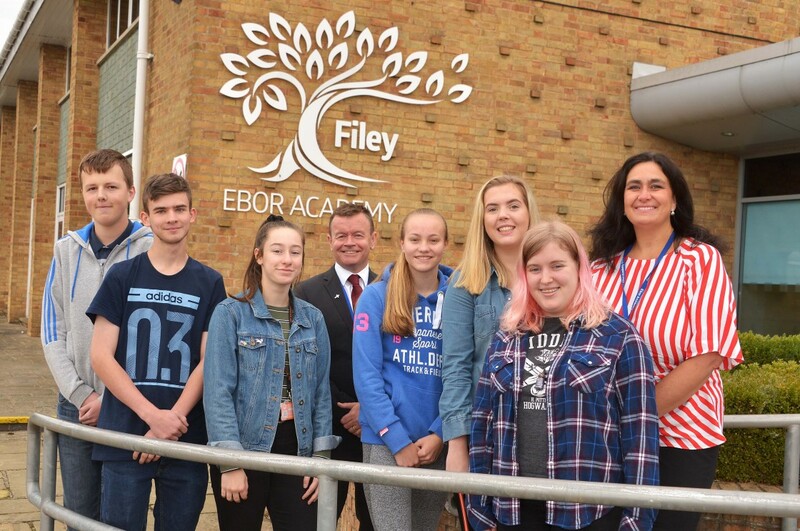 Starting the next stage of their education are these former Ebor Academy Filey students, whose achievements in GCSE exams in the summer have been applauded by new Headteacher Terry Cartmail. “All of these students worked extremely hard and as a result were phenomenally successful in their GCSEs,” said Mr Cartmail. “Most either achieved or surpassed their target grade in all of their subjects. An increased intake of 85 Year 7 students started this school year at the Muston Road school, and their Open Evening for Year 5 and Year 6 students to have a look around is scheduled for Tuesday 2 October. Pictured with Mr Cartmail, Headteacher at Ebor Academy Filey, centre, and on the right Mrs Amanda Pickering, Key Stage 4 Leader, are, from left: Dean Sutton, now at East Riding College studying Level 3 ICT; Callum Johnson, also at East Riding College studying Level 3 Travel and Tourism; and Scarborough Sixth Form College students Linsey Correia, studying Biology, Chemistry, Psychology, and BTEC Sport; Megan Simpson, studying Biology, Psychology, and Double BTEC Sport; Sophie Cowton, studying Biology, Chemistry, Psychology, and BTEC Sport; and Alicia Hardman, studying Maths, Further Maths, Music and Graphic Design.